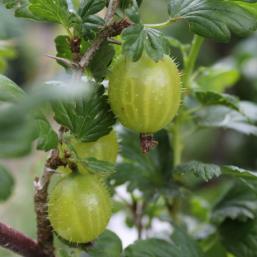 Gooseberries are one of the earliest soft fruits to ripen in spring. Looking rather like a cross between a grape and a currant, their flavour can be anything from excitingly sour to rich, sweet and mellow. 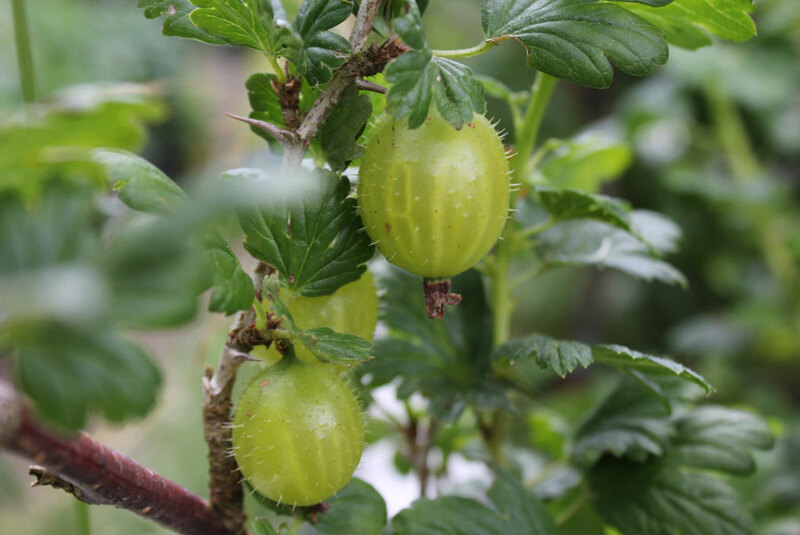 Gooseberries are really a cold climate treat, they can be eaten raw but are more often found inside puddings and preserves. 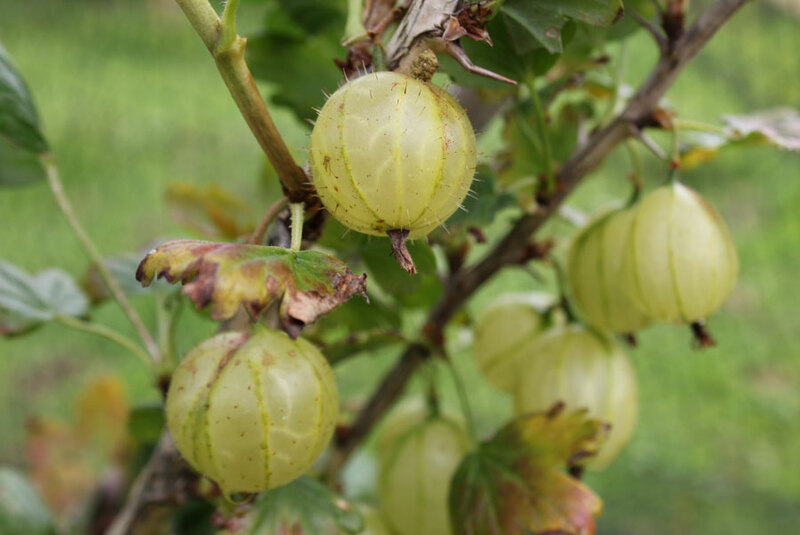 Gooseberries are produced on small, thorny bushes and generally prefer to grow in areas that have cold winters that simulate formation of flower buds. 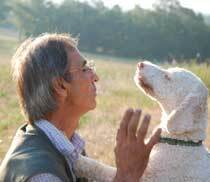 However, there are varieties more suited to areas with warmer winters. 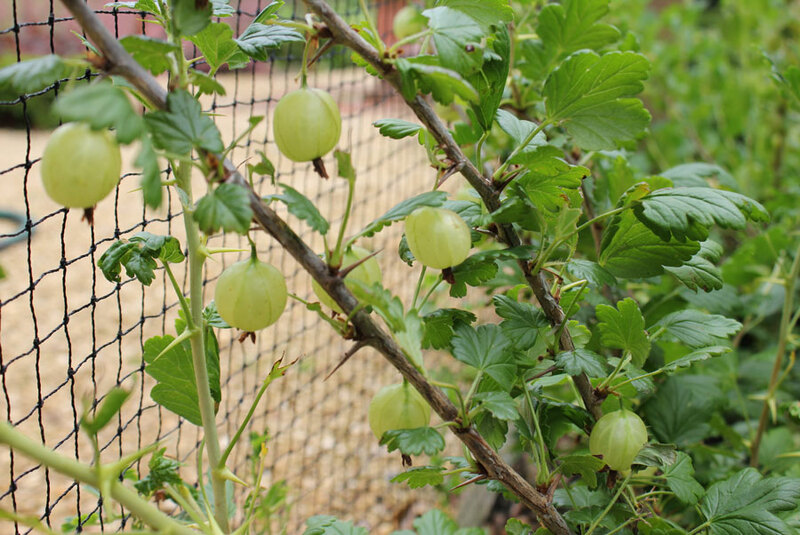 Gooseberries are self-fertile – meaning the can be pollinated by themselves so you don’t need more than one plant. Plants are grown as bushes or trained as fans, espaliers, cordons (single stems on an angle) and standards (lollipops). They are good for growing in containers. 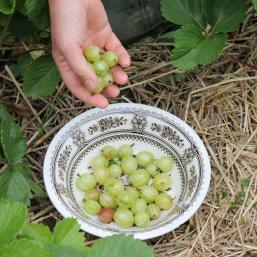 Quantity 1 - 3 bushes or more per household – depending on how much you like gooseberries! Invicta produces large pinkish green fruit with good flavour – eat them raw and cook or preserve them. A reliable disease-resistant and a heavy cropper. Watch those thorns. Pax produces large sweet reddish purple fruit when ripe on plants that have been thinned. A fast growing variety that responds well to pruning and shaping. Plant container grown gooseberries year round. Bare root plants are planted in autumn and early to mid winter. Gooseberries like morning sun and afternoon shade, they will grow well in shadier parts of the garden. Where space is tight, they can be grown in containers. 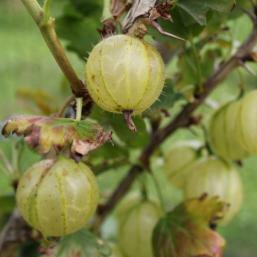 Gooseberries like cool, rich soil that holds onto some moisture at all times without becoming water-logged. Something with a good mixture of soil and rotted organic material. Plants should be spaced a short stride apart to make a hedge or a full stride apart if being grown as individual specimens. 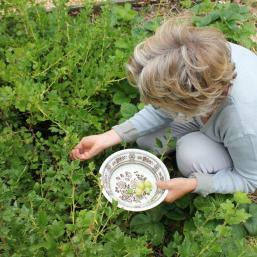 Soak the roots of gooseberry bushes in water before planting them. Prepare the planting area. Soil should be weed-free and well dug through to at least a full spade’s depth. Dig a hole that is just larger than the container the plant is in Add a spade full of sheep pellets or a sprinkling of blood and bone meal to the soil in the bottom of the hole and mix well. 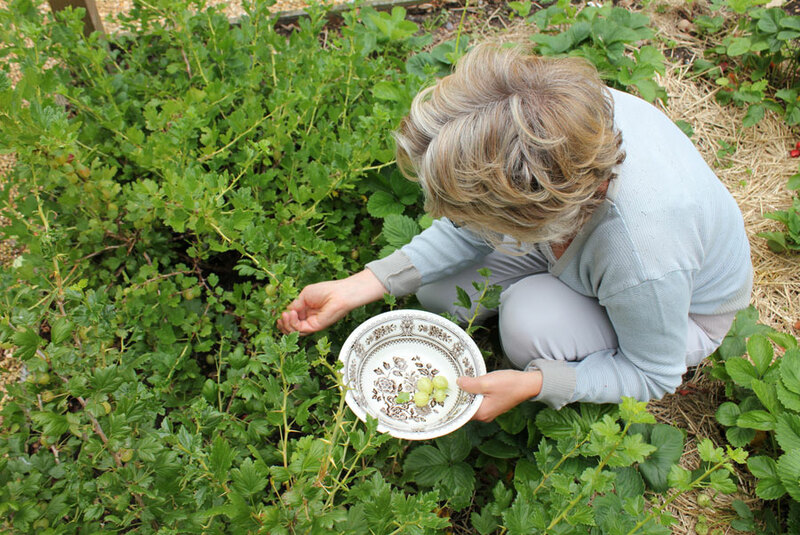 Place gooseberry bushes in holes so that container soil level and surrounding ground level are the same. Back fill around root ball making sure there are no air pockets. Water well and mulch with sawdust, pine needles, old straw or shredded bark. 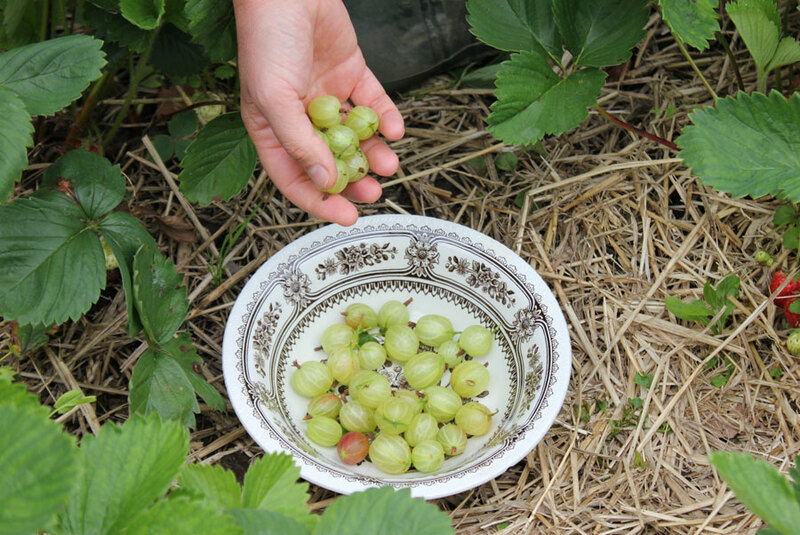 Bare root gooseberry plants: Soak your bare root plants in a bucket of water. Dig a spade deep hole - about a forearm’s length square - in your pre-prepared planting spot. Half-fill the hole with compost and mix with soil at the bottom - if you want to you can add a couple of spades-full of coarse sand or fine pumice to help with drainage. Make a shallow mound in the centre of your hole and sit the bare root tree on the mound with the upward-pointing stem in the middle and the roots radiating around it. To back fill, gently work the mixture of soil and compost around the roots, firming the soil as you go until you have all but filled the hole to ground level. Fill the low depression that is left with water and allow soil to settle around the roots. Then finish filling the hole up to finished ground level. If planting in a container choose something large enough – half barrels look good and offer sufficient space for a long-term planting. Mix equal quantities of rich organic compost with some topsoil and then add a couple of spades-full of grit. Ensure containers drain well and do not collect water. Fill container to within a thumb’s depth of the rim. Plant gooseberry bush in the centre with container and plant soil levels the same but still a thumb’s depth below the rim. Water well and mulch with compost old straw or shredded bark. NB. After planting give plants a quick trim and tidy. Remove untidy crossing stems and shorten back and spindly weak-looking stems. Trim any low branches that are touching the ground. It is important to keep plants weed free and to maintain constant soil moisture in the growing season. 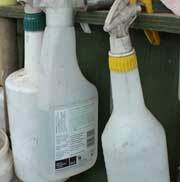 Always water at the base of plants – avoid splashing foliage as this can spread fungal disease. Watering is reduced as fruit start to ripen. Feed: Sprinkle untreated wood ash around the base of plants in spring to boost flower and fruit – you can also use an application of liquid seaweed. 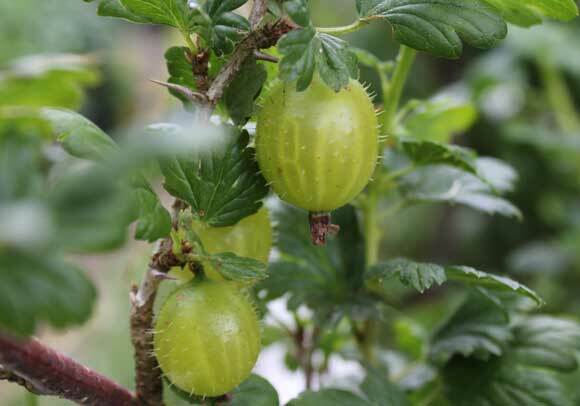 Gooseberries don’t need too much feeding if soil has been well-prepared but it can help if you maintain a mulching layer of worm compost, straw and sheep pellets as fruit start to form and ripen. Don’t over-feed, too much nitrogen causes soft leafy growth that can make plants susceptible to fungal diseases and attractive to aphids. Flowering: Currants are an early spring flower in the garden. They are self-pollinated but bees and insects can help to improve pollination and increase yields. Planting a few gooseberries together can help boost pollination. Care: Fruit are thinned to allow plants with heavy crops to produce a harvest of good-sized fruits. This can be done when small fruit have developed and spacing can be judged accordingly. Alternatively allow fruit to ripen and stagger your harvest, taking small berries when still immature – these have a bitter tartness that makes them suited to being cooked. This leaves a set to ripen to a larger, sweeter size that can be enjoyed raw in fruit salads, on museli or with cheese. Fruit are formed from late spring. Pick by hand with a short stalk – watch out for thorns along the stems. Storage: Gooseberries will last for several weeks if chilled in the fridge. Gooseberries can be frozen for use in cooking or preserving at a later date. Spread them out on plates or trays in the freezer until frozen and store in bags. Pruning is aimed at creating an open-shaped bush with an uncluttered centre that allows for good airflow and lets sun get to ripening fruit. You want to end up with a plant that has a short clear stem from the ground and then a framework of main stems radiating out to create a goblet shape. To do this, cut back the five strongest growing stems by three quarters and remove all lower shoots and basal shoots on newly planted gooseberries. Cut back main stems by half in the first couple of years. Remove all crossing stems from the centre. After this, cut back all new growth on main stems by half in winter and trim all side shoots on these stems back to two buds. In summer cut the side shoots back to five leaves leaving the main stems to be pruned in the following winter. Remove any over-crowded stems. As plants get older, they are renewed by removal of woody, older stems that are cut right back into the plant. This promotes growth of fresh new stems that will bear fruit. 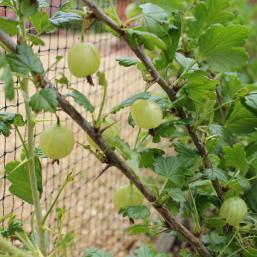 Gooseberries can be pruned to grow as fans and espaliers of carefully spaced stems against a wall or fence. Stems are pruned to maintain a strong framework and to stimulate new shoots that will produce flowers and then fruit. General maintenance involves removal of dead, diseased and crossing stems. 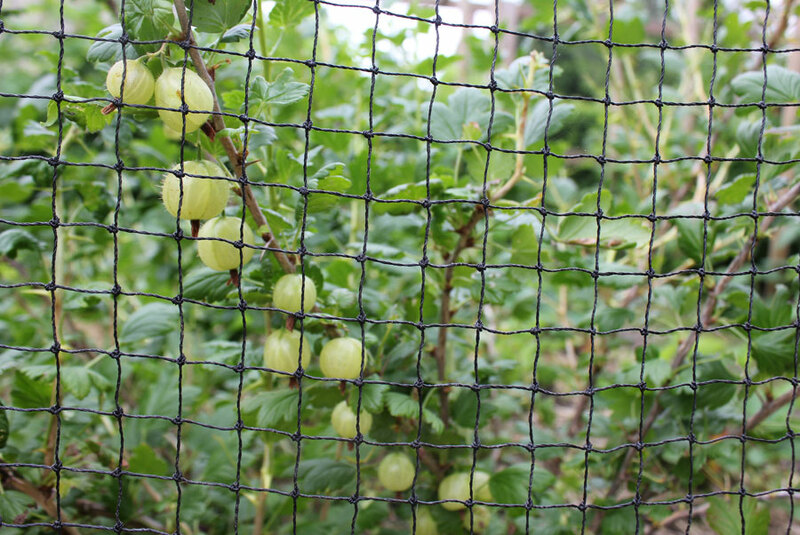 If you get their growing conditions right gooseberries should be trouble free. They are susceptible to mildew in humid climates and aphids can be a problem at the tips of soft young shoots. In winter hungry birds eat the young developing buds and they’ll also strip plants of ripe fruit in summer. 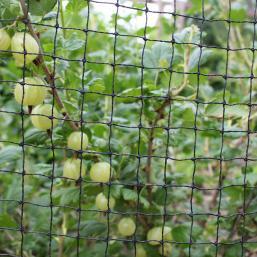 Cover with bird mesh or grow with other berry fruits in a fruit cage.